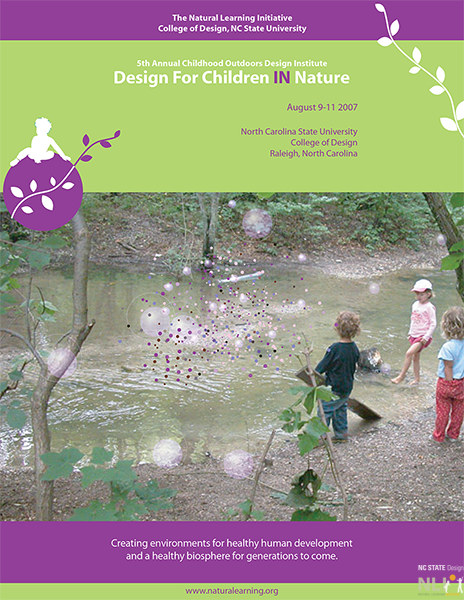 The Natural Learning Initiative, a unit of North Carolina State University, is committed to promoting the importance of the natural environment in the daily experience of all children and families, through environmental design, research, education, and dissemination of information. For the 5th year in a row, we’ve conducted the Annual Design Institute, which is geared towards education and practice in designing for children in nature. The Design Institute continues to grow every year due to the high demand for professional training from various institutions such as museums, zoos, childcare centers, schools, etc. Why is community design for children and families important? What can be done through design to address the lack of contact with nature? How can outdoor environments for children and families be better designed? During the conference, participants also experienced an outdoor activity with children where they rediscovered their inner child and learned how to create a magical and imaginative outdoor environment. Robin Moore, Director, Natural Learning Initiative, College of Design, NC State University. Nilda Cosco, Initiative for Inclusive Design, Coordinator, College of Design, NC State University. Dogan Arthur, Architect, D.W. Arthur Associates Architects, Boston. What is the Connection between Nature and Architecture? David Becker, Associate Director of Learning Experiences, Hamill Family Zoo. Interactive Nature Play at the Hamill Family Play Zoo. Cam Collyer, Program Manager, Learning Grounds Evergreen, Canada. Insights from 6 yrs of Institutionalizing Green School Grounds. Nancy Easterling, Coordinator of Horticulture Therapy and Children’s Programs, NC Botanical Garden. Panel Discussion. Andrea Faber-Taylor, University of Illinois at Urbana-Champaign. Evidence that Green Spaces are Children’s Growing Places. Jim Greenman, SVP for Education, Bright Horizons Family Solutions, Child Development Center. Panel Discussion. Rick Lemon, Director, National Conservation Training Center, U.S. Fish & Wildlife Service. Welcome Session. Martin Maudsley, Coordinator, Wild About Play, United Kingdom. Playwork and the Built Environment.